Honda pulled out all the stops to present their new Civic to the press pack in exactly the right light. The usual suspects gathered to talk cars in the gracious border town of Albury. The place is choc-full of stately homes, tumbled down barns, and beautiful sweeping roads through postcard-pretty countryside. The drive was punctuated by presentations. One such presentation saw a Civic hoisted above our heads to showcase the uber-slippery undercarriage. 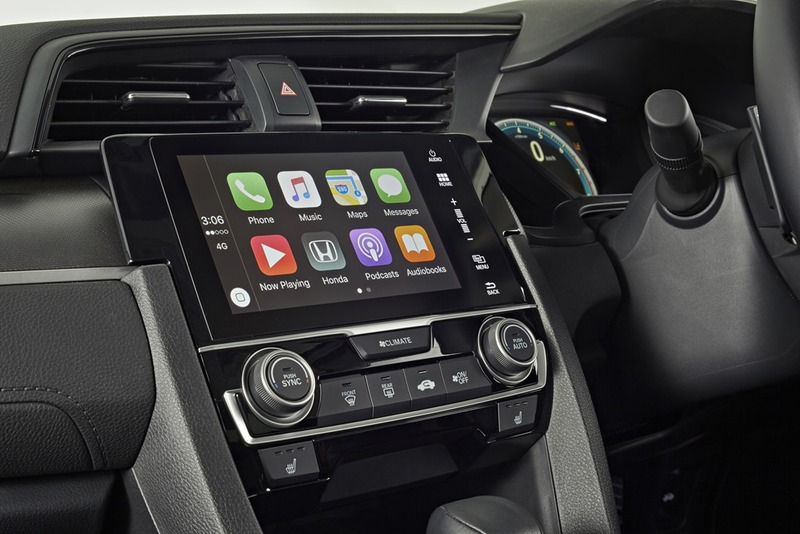 Honda acknowledges the brand had fallen behind the market in tech and quality. Civic is the latest and most advanced in the push to regain a consideration on a punter’s dance card. Designed to be slippery and quiet. The sweeps, lines, and bumps are all there for a reason. The front side windows have thicker glass to quieten the turbulence off the side mirrors and the grille is carved to aid flow. The very soft windscreen wipers are shaped to aid airflow at high speed and can be parked upright to help when new blades are required. The top models in the 5 level line-up score a cool LED headlight and all have DTRLs (day time running lights) along with a full LED “Light Pipe” rear end (whatever that means). The side profile has gone all hatch-meets-fastback, yet is a sedan with a generous boot. 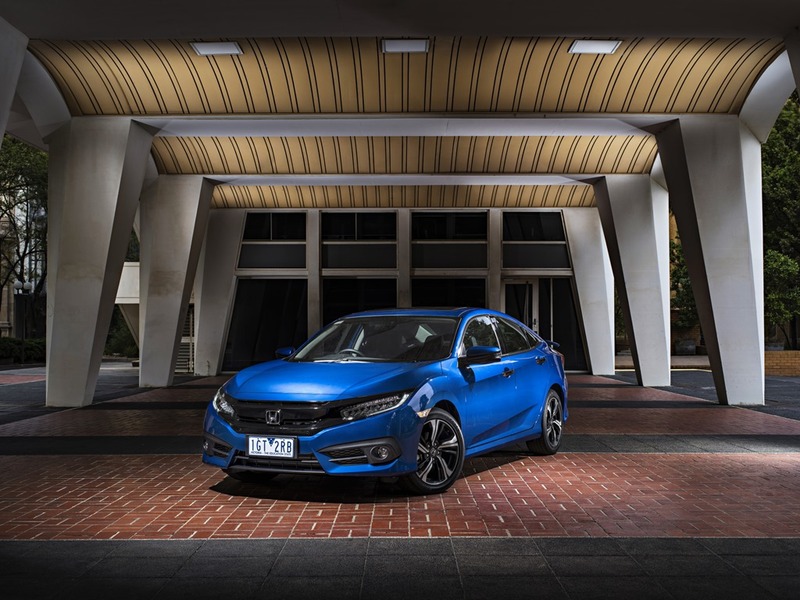 The hatch and sedan Civics will share a common look and will now be made in the same place. The previous models were essentially two different cars, made in two different places, designed by two different parts of the company. The swish-looking Thai factory that is so new that it still has the plastic wrapping on the office chairs and the price tags on the coffee machines. You could eat your dinner off the floors. Civics’ underside has covers, flaps, and hefty sound shields designed to make the cabin quitter. The bonnet and lower door edges have extra rubber seals to lower wind noise. The wheel arches and rubbers tabs underneath direct airflow around the tyres which present as square blocks in a wind tunnel. Who knew? It means the joints, undercarriage, seals, and glass all work together just as they were designed to. The shopper will notice none of this, but once on the road will remark, “it’s nice and quiet”, and that it exactly as it should be. The pov model gets steel wheels and hub caps. Really? Steel wheels? Dead posh cars do not have steel wheels. In the bin with them! From the outside, the differences between trim levels is only obvious for those OCD-inclined car buffs. The headlights are the most prominent with halogens on the bottom models instead of full LED. You have a choice of 8 cool paint colours such as: White Orchid Metallic and Midnight Burgundy Pearlescent. I do love a bit of a pearly treatment that shimmers in the right light. Suffice to say everything you see is there for a reason in addition to the obsessive need to look pretty. 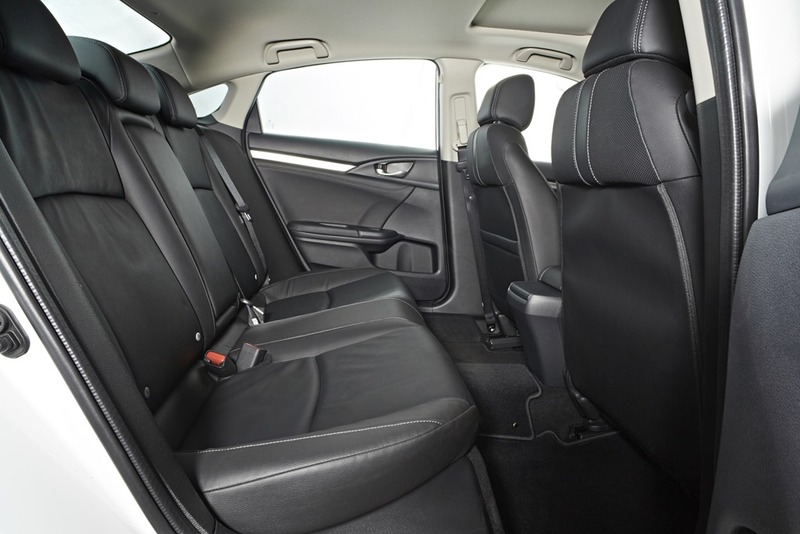 Rather cheekily, the Japanese car maker benchmarked the new cabin design against the delicious interior of Audi’s A3. It is Stylish, classy and above all, comfortable. Motoring journos are responsible for the current trend of judging an interior by how soft the plakky bits are, and Civic is stuffed full of it. Much of it looks like a sneaky bit of stitched leather, and other surface treatments mimic engine-turned metals of the 30’s. It has the tactile quality that has definitely been AWOL these last few years. Gone is the dual layer of driver-instruments from the previous model. I liked it but it made the dash look frantic in a boy-racer-gamer kind of way. The new dash has a cleaner look. Most of the buttons have been chucked in the bin and their functions subsumed to the touch controlled centre tablet. The tablet stands slightly forward on the centre stack. I was concerned that sunlight would wash out the display, but not a bit of it. The LCD is as easy to read, even in blasts of full afternoon sun, and the high res screen has a very wide viewing angle. Some of the buttons on the steering wheel have capacitive touch control as if you were sliding your finger up an Iphone. Using the Tablet is just like using your phone. You can pinch, swipe, and press to select. There is WiFi, Bluetooth, and “hallelujah praise the lord”, Apple CarPlay/Android Auto. Honda’s previous efforts in this area were disappointing to say the least. It was difficult to use and you needed a PHD in electrical engineering to use the functions. CarPlay is as easy as plugging in your phone, no pairing needed, just a couple of confirmations during the first connection. Apple apps then appear just as they would on the phone and are used in the same way. Although not an expert in Android, it is a bit of a mashup and is nowhere as easy to use as IOS. The tablet is in all models, so those without Satnav can use phone Maps for guidance, even if you have the god-awful steel wheels. If there is one fault, it is that some car functions need several button presses to get to, and you have to know where they are. It’s not quite as intuitive as I’d like and the direct access buttons feel randomly scattered. The climate button is in the centre above the A/C controls. Pressing the climate button opens the climate screen where even more climate controls are found. There are some other touch controls down the right hand side, and further capacitive menu controls across the top. The layout is much harder to use than Ford’s Sync II or Holden’s MyLink. Familiarity would make a huge difference but our test cars are pre-production models bereft of user guides. You can use SIRI for some hands free functions just as you would use the phone directly. It means you can text, select music and do searches all by voice commands, but only while in mobile range. The premium audio has a decent sound but not quite as nice at highway speeds as I’d hope. Despite the quiet cabin, the audio sounds a little weak. One last problem in an otherwise immaculate interior is the rear seat passengers can’t slide their feet under the low-slung front seats. This makes the back seat feel tighter than the figures would indicate. The driver’s seat has height adjustment which usually creates more floor level space for anyone sitting behind, so that might well help. The seats fold down to make the huge boot (between 517 and 519 litres) even larger depending on model. The work put into noise reduction really pays off at speed and hasn’t added significantly to the weight of the car. Although insulation is heavy, much of the noise dampening was done with technology and design. The seats are comfortable even in the rear. 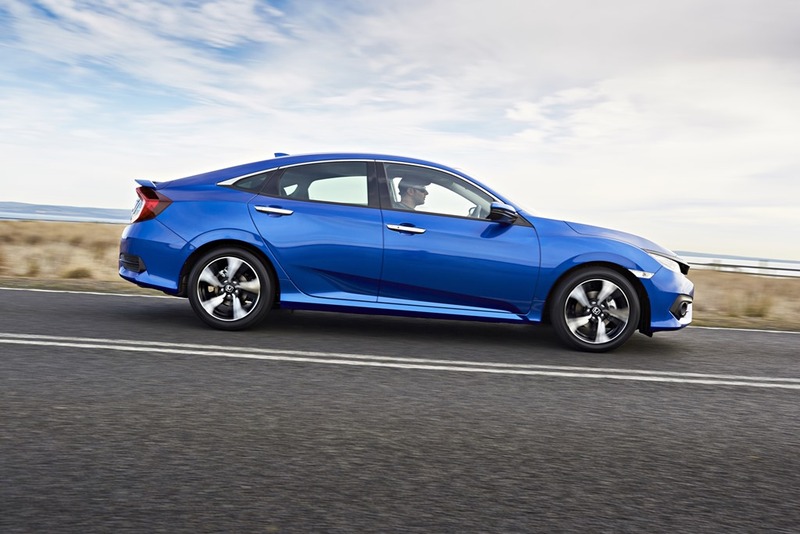 We could easily imagine doing a road trip in the Civic. 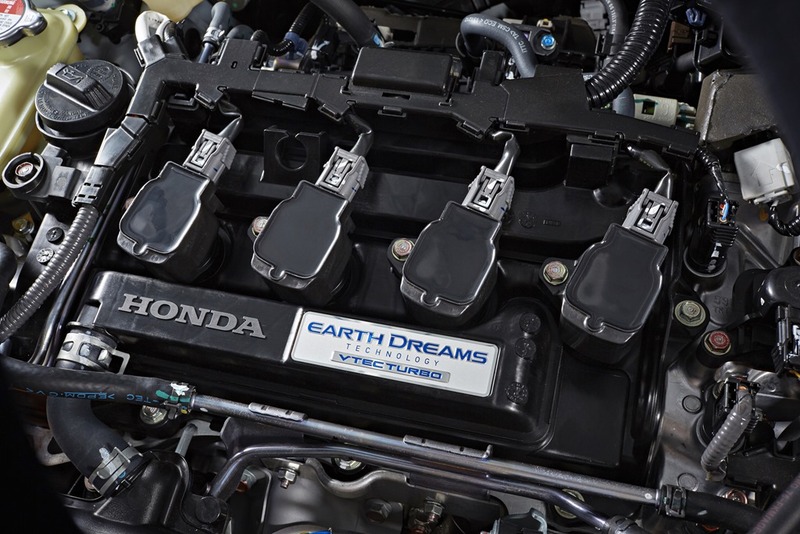 There are two Earth Dreams engine variants, a 4cyl 1.8 petrol (10wkw/174Nm) and a 4cyl 1.5 turbo petrol (127kw/270Nm). As good as Honda engines have been, the lack of a turbo and cabin tech was starting to be a problem in the minds of buyers. Civic bristles with techy goodness. Depending on your pocket, you can have active lane departure, autonomous emergency braking, road departure mitigation, lane Watch, and radar cruise control with queue assist function. I was impressed by the fact that the queue assist goes to zero kph. The honda system needs driver input to proceed from stop, either by the resume button, or a quick blip of the accelerator. Honda don’t want their cars mowing down pedestrians on crossings which would be a bad look. There are two of CVTs depending on the model, and both act like normal CVTs until you sink the boot in. It then acts like a normal automatic transmission stepping up the gear ratios. It is all to do with efficiency and the fact that a CVT saves on weight over a normal auto. The 1.5 turbo gets paddle shifters for drivers who like a bit of say in how things are done. While on the subject of trim levels, there are 5 which are VTi, VTi-S, VTi-L, RS, and VTi-LX. The RS definitely does not mean Rally Sport in this instance. 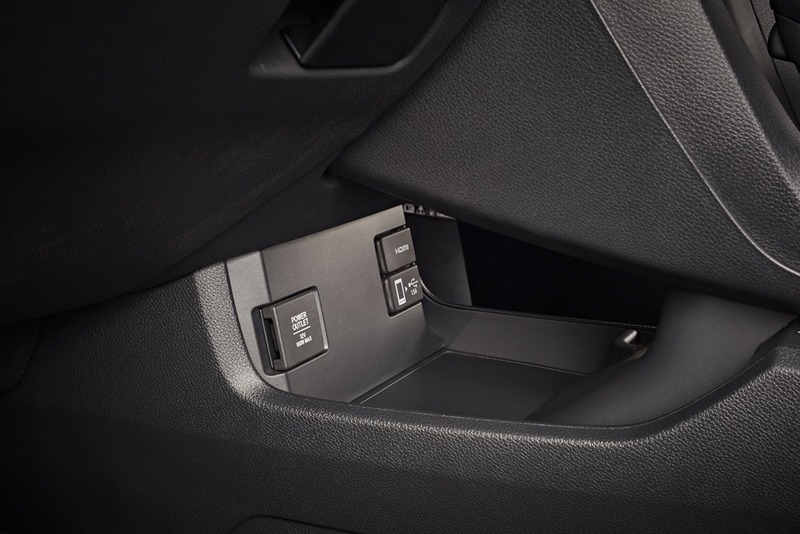 Features are added as you go from left to right and a full list is on the Honda website. The word “safety” was mentioned so many times, I thought was the name of the new car. None of that matters if the drive is sub-par. Again, it’s gone from staid to stellar in a single generation. The dual pinion electric power steering is the more expensive rack mounted type we normally see on premium brands. Honda claims this, and a stiffer body makes the Civic the best handling car in the 40 year history of the range. It feels tight with little flex even in heavy cornering. The suspension is new, with Macpherson struts at the front and multi-link in the rear. So, in addition to better handling, the ride is feels sophisticated and is more limo-like then previous models. 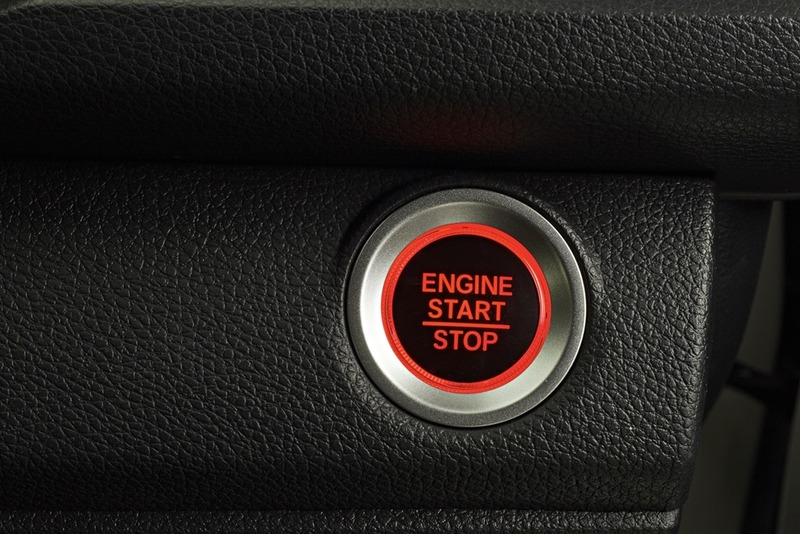 The smart/start/entry means you can leave the ignition key secreted about your person. The benefit of not having to search your nether regions before every quick trip to the shops can’t be overstated. Anyone who has used it before quickly finds they can’t live without it. Rather cleverly, lunch was had at a local winery in the grounds of a stately mansion. Our arrival was like entering a movie set. With the Tree lined gravel drive, the castle-like winery, and the stately mansion in the distance, you would be forgiven for thbinking it was a mashup between Falcon Crest and Downton Abby. If Honda was trying to get us to picture a Civic on the gravel drive parked right next to a Roller, they succeeded. Campery aside, this first drive was a successful one. 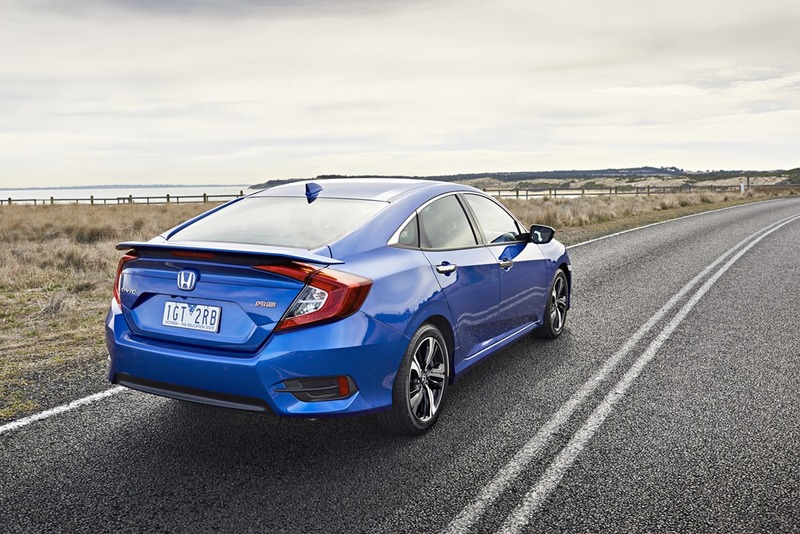 The sweeping country lanes and tight corners showed Civic to be a competent handler. The highway sections proved her rights to claim the touring badge with a boot big enough to make long loads a doddle. Fold down seats provide even more space. Honda shamelessly aimed Civic at Queen Mazda. The 3 battles for supremacy over the slightly less interesting Corolla, but neither are as nice to drive as the Civic. Importantly, Civic has a prettier face and much nicer cabin then either of the others. Civic has excellent steering, though not quite as sharp as Golf or Focus. Honda has reclaimed its position as premium Japanese auto maker, but only the buyers will decide how successful it is. Civic has sold many tens of millions over the years so it deserves to be on the shoppers list of “possibles”. I was impressed with the value for money. Honda says it is “getting the mojo back,” which is a claim that just might have legs. The R version is yet to be released, and if this premium level of detail is applied to all future models, Honda might need to buy in some extra order pads. Their problem is getting bums on seats for test drives. This is a tightly contested segment which has overtaken large cars as Australia’s favourite, if you don’t include the balmy off-roader-obsessed soccer-mom brigade. 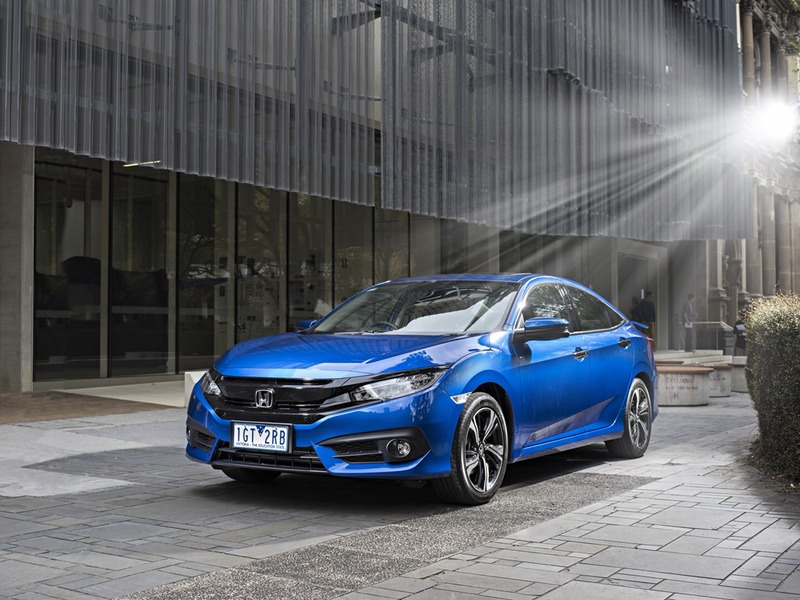 The attractive body, comfy cabin, and up to date tech make Civic a real proposition for the first time in years. This isn’t a cutting edge jump, instead it brings Honda into line with market expectation. The looks won’t appeal to everyone, but I for one am happy to see the back end of dreary hatches and soulless sedans. Would I buy one: Yes, despite my reservations about CVTs. In saying that, I heavily resisted electric power steering before accepting the ever onward march of progress, and here we are.